Ceramics are prone to breakage, so most potters avoid making pieces with protruding bits. But Hadrian Mendoza has apparently been in a prickly mood. The series that provides the title of his Zenith Salon show, “Dangerous Flower,” features toothy tendrils that bristle from spherical forms. These are inspired by the “mathematical design of the stamen,” a gallery note explains. But there also are a “Cactus,” a few large “Blooms” that resemble dinosaur mandibles and several busts of spiky-haired punk rockers. Heads are as common as blossoms in this selection, in fact. The Philippines-bred local artist is showing a horizontal lineup of ceramic craniums that includes a cat-pig and an E.T. with large, goggle-like eyes. 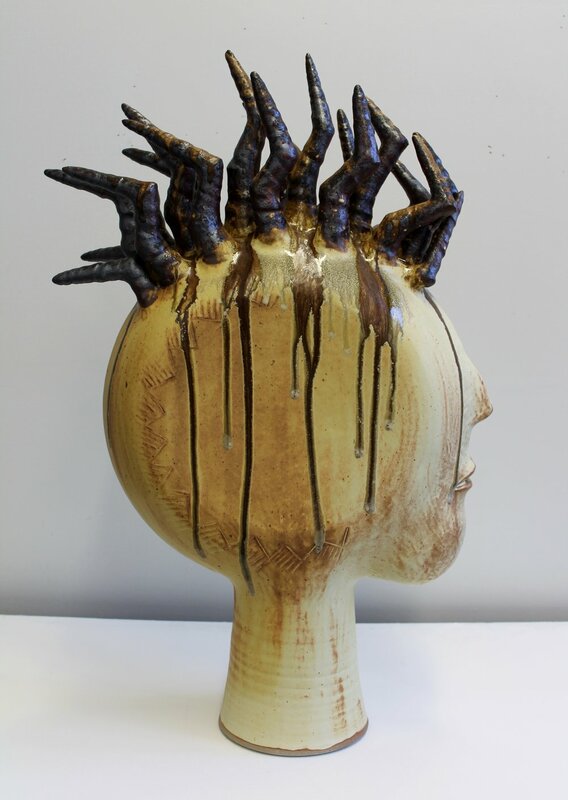 There also are a circular series in which glazes drip into moptops and a smaller set with elastic cords that dangle from skulls like dreadlocks. The forms are inventive, and so are the surfaces, which range from matte to glossy and uniform to mottled. The earthy colors emphasize that Mendoza’s work in made of clay, even when he transmutes it into something as a filmy as a flower or a cloud. Dangerous Flower: Hadrian Mendoza On view through July 8 at Zenith Gallery, 1429 Iris St. NW. 202-783-2963. zenithgallery.com.